Letting properties require safety certificates of various kinds and BDP allows you to record the details and due dates. In the Tools menu on the left below the main menu, click “New safety certificate”. Assign the certificate to a BDP user. This is so that any reminders sent out relating to the certificate will be sent to this user. Pick the date and time of the expiry of the certificate or when you want the reminder to be triggered. 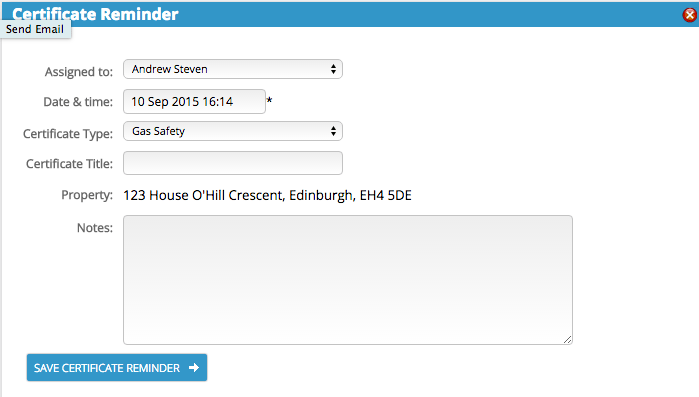 Note that BDP can be configured to send reminder emails, calendar appointments, etc. at the time of an event or before or after an event. If your policy is to enter the actual expiry date of the certificate, then BDP can be told to send an expiry reminder some days or weeks in advance. If your policy is to set the certificate reminder in advance of the actual expiry date then the BDP event can be set to run at the time. Select the certificate type from the drop-down list. Give the certificate a title. In all lettings properties and each tenancy record you will find the Safety Certificates widget which lists all current and past safety certificates.